The essay The „Romantic Revolutionary": Ferdinand Lassalle and the German Labor Movement was based on a lecture that I delivered on 1 March 2011 at the Jerusalem Institute for Israel Studies at the international conference "Jews and Revolutions: From Vormärz to the Weimar Republic." The conference was organized by the Israel office of the Rosa Luxemburg Foundation, the Leo Baeck Institute Jerusalem, the Martin Buber Chair for Jewish Thought and Culture of the University of Frankfurt-Main, and the Centre for German-Jewish Studies at the University of Sussex. The same institutions organized on 19 and 20 March 2012 at the same place the international conference "Moses Hess between Socialism and Zionism." There I spoke on Moses Hess and the Marxist Discourse since 1945. The text of my contribution is printed here in an updated version with additional remarks on Hess’s biography and scholarly debates in the West. 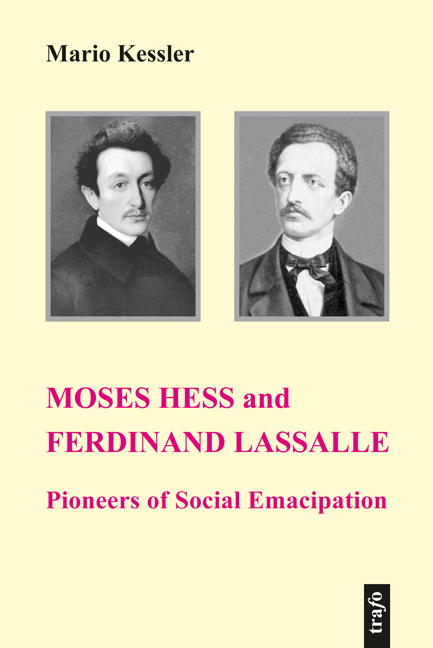 I am greatly indebted to the organizers of both symposiums as well as to the extraordinarily attentive audiences that demonstrated an enduring interest in the fate and legacy of "double outsiders", such as Moses Hess and Ferdinand Lassalle who were marginalized both by origin and by conviction: as Jews and revolutionaries. Both fought for authentic equal rights of the working people and, consequently, belonged to the founding fathers of the German labor movement. Both were companions of Marx and Engels and, likewise, independent-minded thinkers. Their political and intellectual heritage was, therefore, often belittled or neglected in the countries that claimed to be socialist, and it is the aim of this little book to introduce readers into the rich legacy that Hess and Lassalle left for future generations of activists and students of the democratic-socialist movements. I am greatly indebted to Mr. Terence Renaud (Berkeley and Berlin) for his helpful suggestions for stylistic improvements.